Convert audio files to MP3, FLAC, M4A, AAC, Opus, Apple Lossless, Vorbis and many more audio formats. Securely rip audio CDs in perfect digital quality. Batch convert many audio files at once. Convert audio from 50+ file formats. Burn audio CDs. Music Converter optimized for audio quality. Batch convert audio files between all audio file formats with the high accuracy 64-bit precision audio converter. Audio converter converts up to 64 audio files in parallel for the maximum performance on multi-core processors. Edit metadata of the files and preserve all metadata on file conversions. 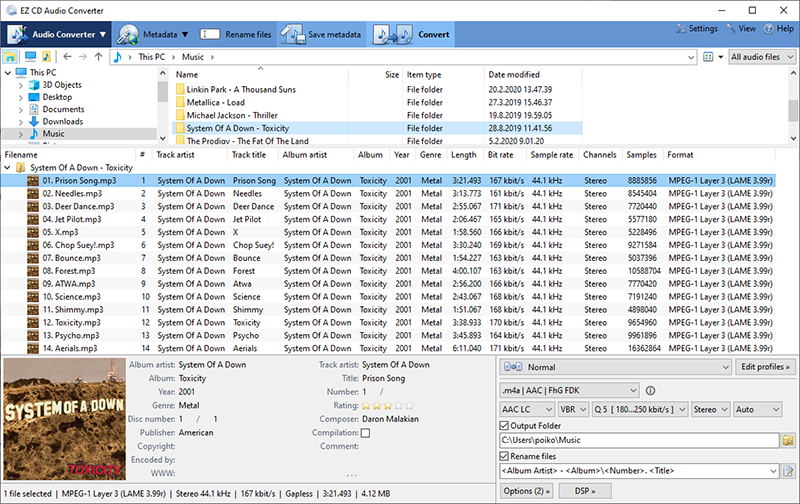 Secure CD Ripper rips audio CDs to all audio file formats with error detection and two-pass CRC verification for the bit perfect audio quality. Download high quality metadata and cover art from 6 online services; GD3, WMP, MusicBrainz, Discogs, Amazon, and Freedb metadata services. All the best audio codecs are included. Convert WAV to MP3, FLAC, M4A to MP3, AAC, Opus, WAV, OGG, and all other formats without downloading additional software. This page was last modified on 12 April 2019, at 18:06.